In 1983 the labs of Walter Schaffner and Susumu Tonegawa announced the discovery of a class of sequences in animal genomes that regulate gene expression at a distance, sequences we now know as transcriptional "enhancers". We now know that there are tens of thousands of enhancers in animal genomes, and that they play a critical role in the generation of spatial and temporal patterns of gene expression during development. However, despite over thirty years of extensive, we still have a poor understanding of how enhancers work. We use a combination of experimental, evolutionary and computational genomics, high-resolution imaging, genome engineering and classical biochemistry and genetics to study the ~1,000 enhancers active in the early fly embryo. Our current focus is understanding how enhancer identity is established during early embryogenesis. 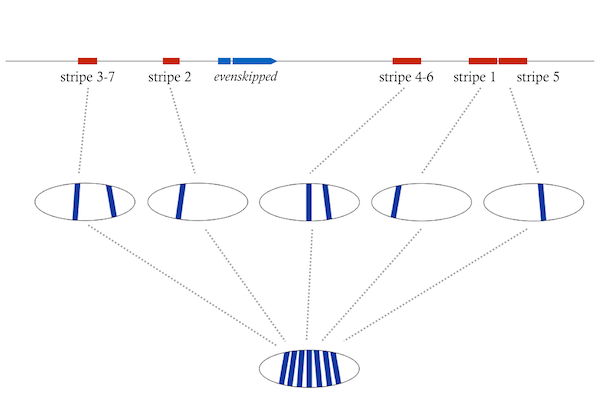 Several years ago, we discovered that essentially all of the enhancers active in the early Drosophila embryo contain a short sequence motif - CAGGTAG - that is not the target of any of the dozens of transcription factors involved in patterning the embryo. This motif was initially discovered by Tom Cline's lab, who showed that its presence in the promoters of the first genes transcribed during embryogenesis is required for their activation. In 2008, Chris Rushlow of NYU identified a maternally depositied protein, which she called Zelda, that binds to this sequence and is required for early embryogenesis. We immediately became interested in Zelda, and showed, in collaboration with Melissa Harrison, now at the University of Wisconsin, that Zelda binds to early embryonic enhancers and promoters well before they become active - before most patterning transcription factors have even been expressed. 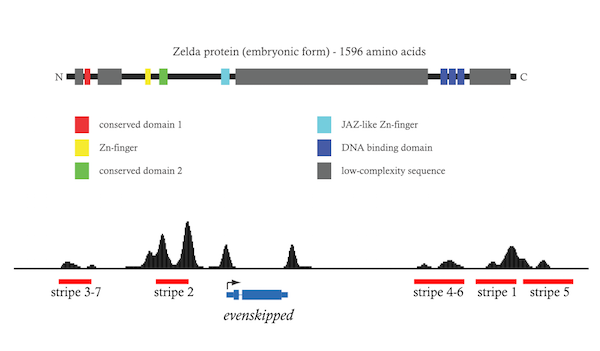 This suggested to us that Zelda might help to resolve the mystery of why, even though transcription factor binding sites are found across the genome, only a small fraction of the genome functions as enhancers at any stage. We have subsequently shown that early Zelda binding triggers a cascade of changes to nucleosomes that flank its binding sites, and lead to these sequences having a distinct chromatin state that renders them accessible to transcription factor binding. This mode of enhancer activity - one factor (or more likely set of factors) determining where enhancers will be located, and a separate set of factors binding to these sequences and producing specific transcriptional outputs - is similar conceptually to that of so-called "pioneer" transcription factors described in detail by Ken Zaret and others, although we believe Zelda uses a very different set of molecular mechanisms. We are continuing to study Zelda and this mode of enhancer activation using a variety of genetic, genomic, biochemical, structural, imaging and evolutionary approaches. The function of most enhancers involved in early Drosophila development is highly conserved, yet the organization and composition of these enhancers varies considerably. We have used a combination of sequencing, transgenic analysis and evolutionary modeling to characterize the ways that enhancers evolve in the hope that it will tell us something about the relationship between the organization of binding sites in enhancers and their function. We are currently sequencing a large number of members of the Drosophila montium group, which has ~100 species that have diverged in the last ~15 million years, with varying degrees of relatedness to each other. We will use these data to develop a precise model of the evolutionary dynamics of enhancers and to develop and test models of enhancer function. Temperature affects both the timing and outcome of animal development, but the detailed effects of temperature on the progress of early development have been poorly characterized. Using time-lapse imaging, we have tracked the progress of embryos of multiple Drosophila species from shortly after egg laying through hatching at various temperatures. 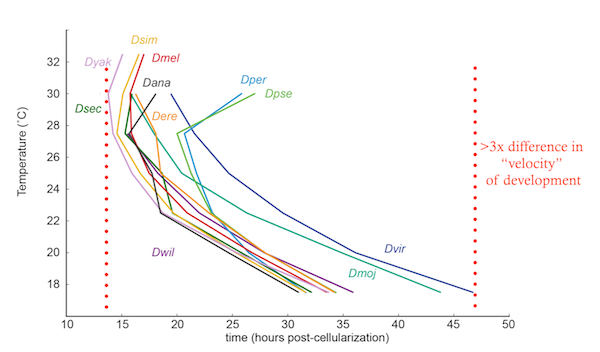 Despite the overall timing of development ranging from 13 hours for D. erecta at 300C to 46 hours for D. virilis at 17.50C, the relative timing of events from cellularization through hatching is constant across all species and temperatures. We are now trying to make sense of this remarkable discovery, to understand how the various diverse processes the occur during embryogenesis could all respond to temperature in the same way, using a variety of genetics, chemical genetics, metabolomics and genomics. All animals, including humans, live in close association microbes – with countless bacterial, achaeal and single-cell eukaryotes living in, on and around then. As the fitness of many of these microbes is affected by the behavior of the animals with which they interact, it is likely that many animal-associated microbes have developed ways of manipulating animal behavior. Many examples of such manipulation are known - e.g. gut bacteria that alter mouse feeding behavior, Cordyceps fungi that make infected ants climb to high places so that their spores will spread over a wide area, and Toxoplasma gondii which induces mice to lose their innate fear of cats so that the parasite can sexually reproduce in the feline digestive system - but the molecular mechanisms that underlie these behavioral affects are unknown. While many of the best described systems are non-model systems that are difficult to work with, we are begining to use microbes that manipulate the behavior of model species - Drosophila melanogaster and Mus musculus - where we have access to a wide variety of genetic and neurobiological tools that we believe will allow us to gain insights into the mechanisms that underly this manipulation. Since the early 20th century, the vinegar fly Drosophila melanogaster and the brewer’ s yeast Saccharomyces cerevisiae, have been the preeminent model species of molecular biology. Although generally studied by separate sets of researchers in the lab, these species are found together in nature on fermenting fruit substrates— an interaction that has received surprisingly little attention. Their co-occurrence is no coincidence: each species benefits from the presence of the other. Ethanol produced by S. cerevisiae protects D. melanogaster larvae from predators, and D. melanogaster larvae preferentially feed on S. cerevisiae , which provides a complete nutritional source for larval development. The non-motile S. cerevisiae, in turn, rely on D. melanogaster and other insects to move to fresh, nutrient-rich substrates. Given the benefits that each species gains from this interaction, it is not surprising that both yeast and fly appear to have evolved molecular mechanisms to actively maintain their colocalization. Anyone who keeps fruits in their kitchen will know that D. melanogaster are attracted to fermenting fruit. This effect is mediated almost entirely by volatile molecules produced by yeasts, and not the fruity substrate, although the substrate can have a significant effect on what compounds are produced. We use a variety of techniques to study the ways that fungal volatiles influence fly behavior, and how they contribute to the evolution and ecology of each of these species.